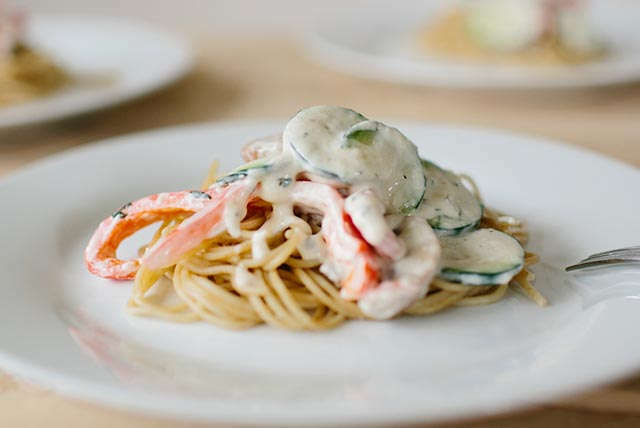 In this colourful dish, fresh vegetables are cooked in olive oil, then added to an easy cream cheese and Parmesan sauce and served over spaghetti pasta. Meanwhile, heat oil in large skillet on medium heat. Add vegetables; cook and stir 3 to 5 min. or until softened. Add cream cheese, milk, Parmesan and oregano; mix well. Cook on low heat 3 to 5 min. or until cream cheese is completely melted, stirring frequently. Drain spaghetti; place in large bowl. Add sauce; mix lightly.